Step in the World of steam, coal and gentle plunging authentic vessels and crafts and do have a look around aboard the steam tug ss “Hercules” and floating crane “Heibok4”. 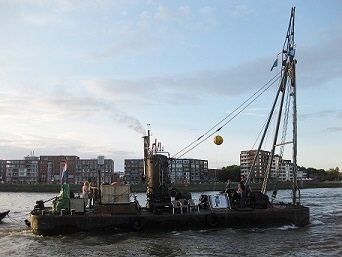 Both steam crafts ss “Hercules” and “Heibok4” do have the Voorhaven in Schiedam as homeport, but are seen at various events throughout the year. Look in the agenda for scheduled voyages coming year or in the logbook to keep up closely with the developments aboard. Now also on SCW ssGoudvisch Facebook. The fleet is managed by the foundation Stichting Calorische Werktuigen and with the assistance of many volunteers kept operational. Step aboard and click on the photo’s for a further acquaintance. 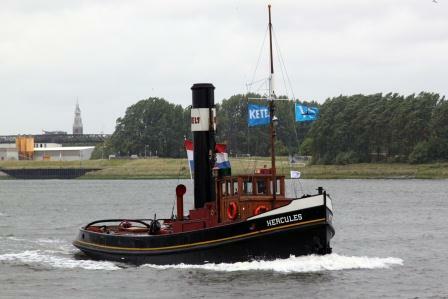 05/06/'12: "Hercules" in hoists "Heibok 4"